I hate grocery shopping. I think I've mentioned that before. I can't say I really enjoy standing in the kitchen wondering what to cook, especially on those nights where the kids have activities and we don't have a lot of time (or for me energy for cooking). The last two weeks I tried something new and it worked, so I'm passing it along for all those people like me who stress over "what's for dinner" and/or are short on time some nights, and/or just want some easy and healthy new ideas. Roasted Vegetables are my favorite way to have most veggies. One, it's so freaking easy. Two, cleanup is easy. Three, they are so versatile. Four, once they are in the oven I have nothing to do but wait leaving me time to catch up on laundry (ha, just kidding - I catch up on shows I've recorded, and maybe do some laundry.) Five, they are delicious. There is this caramelization that happens from the natural sugars that are in the veggies that is just super yummy and rich in flavor. You heard sugar, right? 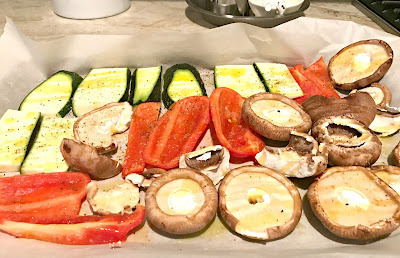 Well, kids that don't usually like veggies that much, sometimes will eat roasted vegetables because they taste a little bit sweeter to them (with no added sugar). Step One: When I got done shopping, I went to town cleaning and chopping all the veggies for meals I would need for the upcoming week. It took a while, I won't lie. It was about 30 to 45 minutes to chop and another 20-40 minutes to roast. While I was at it, I cut up veggies like carrots, cucumbers, and red peppers for the kids' lunches for the week (and on the off chance that I might eat them as a snack versus, oh, say cheddar cheese popcorn.) If you are going to go right ahead and roast those veggies, preheat the oven now to 425 degrees. TIP: To make the chopping and roasting more fun, I blast some music, or I listen to an audio book. The time flies by, and I actually enjoy it. I'm weird in the way that I actually like cutting up vegetables. I find it very relaxing. Step two, throw veggies in a big bowl. You will want to throw veggies with similar roasting times together. Potatoes (regular or sweet), red peppers, eggplant, mushroom caps, brussels sprouts, carrots, zucchini, cauliflower, etc. into the same bowl. Pour Olive Oil on it. I'll let you decide how much, but you don't need to drown them because they typically do not stick so much to parchment paper. Add salt and pepper to taste. Toss it with your hands. Step three, dump onto a parchment lined cookie sheet. Roast at 425 for about 20 minutes (Check your times because the smaller or thinner you cut things the faster it will roast. Likewise, the bigger the pieces the longer it will take.) They key is you want everything you are roasting together to be about the same size. You can roast things like onions, leeks are delicious roasted, asparagus, but you will want to put them in separately because they cook pretty fast. So now you have a ton of roasted veggies. What do you do with them? Here is a list of ideas I came up with that make dinner in 15 (ish) minutes. Throw them into a Fritatta. Put them in a skillet, throw in a can of black beans, and make roasted veggie black bean tacos. Roasted Veggies Sandwiches on Ciabatta (or Focaccia, whatever works for you). Grab some ciabatta rolls, cut them open (remove some of the bread inside if you would like). Brush olive oil on the insides and broil for a few minutes, while you microwave the veggies to warm them up. Spread hummus on one side of the roll, goat cheese on the other, layer grilled veggies and top with basil. I cannot describe to you how good this is. Burrito bowls. Cook some quinoa, or some rice, microwave some canned beans, cut up an avocado and some cilantro throw it in a bowl, top with your favorite burrito toppings and call it done. You can also reheat and use it as a side to your meat dish. Cauliflower and broccoli is delicious with a little parmesan cheese on it. Throw it on a salad, with a little chicken or tuna, (I've even used chicken nuggets and called it Southern Fried Chicken Salad), top with your favorite salad dressing (Balsamic glaze is especially good with sweet potatoes). Boil some pasta, mix noodles with veggies, squeeze lemon juice and drizzle some olive oil, shave some parm on top and you are golden (add a little pasta water if it is too dry). Or, if you have left over cream cheese or that goat cheese mix that in - yummy. There you go, 9 fast, easy, healthy, and most important delicious dinners. A note about versatility... My kids eat veggies, but some are definitely preferred to others. Broccoli, green beans, carrots, red peppers are good, Asparagus and Zucchini are on the no go list. This allows you to customize without adding a lot of work. Cheese helps too.